Thanon Khao San on Pitt Street, Haymarket has some great Thai street food specials. Our love of Thai food is rekindled. Today's happy snap: great chalk art spoofing the Al Pacino Vittoria tv commercial at Cafe Nookie on Cleveland Street. 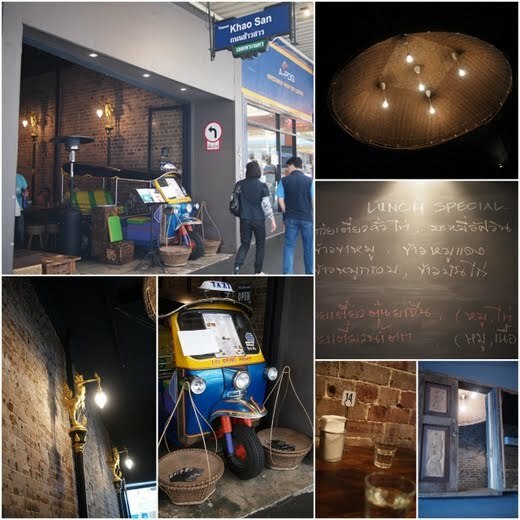 Being named after the notorious Bangkok backpacker ghetto, Khoa San Road (think hair braids, henna tattoos and banana pancakes), and having a tuk tuk parked out the front, we thought Thanon Khao San was just another same-same-but-not-really-different Thai joint. That is until we were lured in by their wonderful display of Thai sweets. We grabbed a menu and noticed it had some great street food and there were lots of Thai folks eating there. Sold. #67 - Khao-Khaa-Moo - Steamed pork meat on steamed rice with cabbage, half a boiled egg & sweet gravy - $8.90. The pork was slow-cooked melt-in-your mouth delicious, the chili sauce was also a lovely surprise, sweet and spicy, and the cup of soup on the side was clean, simple and homely. #63 - Kuitiew-Moo-Tun - Stew pork noodle soup - $8.90. This is also wonderful, it has the same pork as the first dish with rice noodles and a clean, meaty broth. 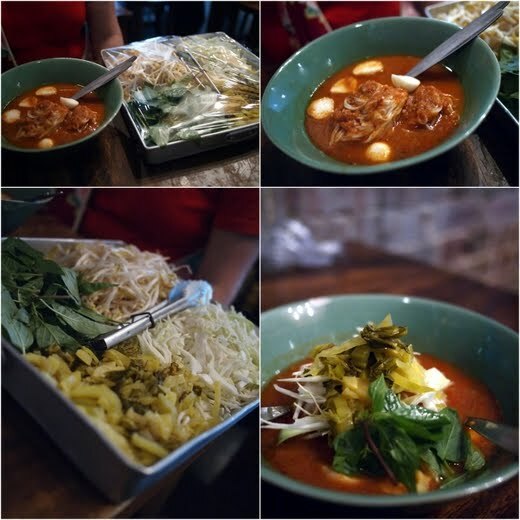 #74 - Kanom-Jean-Namya-Pa - Spicy Thai noodle jungle curry with fish ball - $8.90. Miss Chicken nearly exploded with joy when the waitress brought this one out: it comes as a soup with a big plate of fresh veggies on the side - Thai basil, cabbage, bean sprouts and pickled something. The waitress warned Miss Chicken that this dish was spicy, she wasn't kidding, this baby has a kick! Mix it up with the fresh veggies for divine pleasure. "Better than beer" says Miss Chicken. 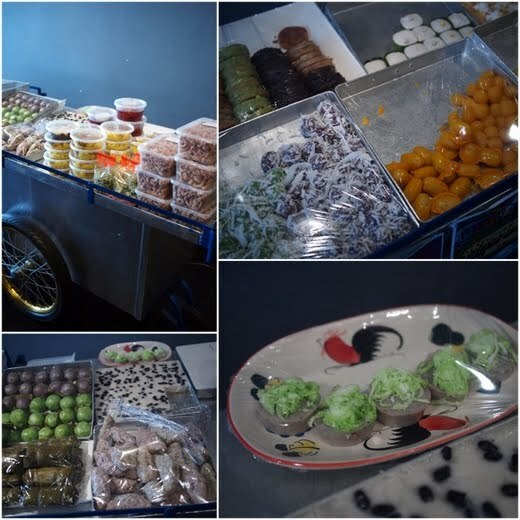 The dessert stand takes centre stage on a hawker cart, a nice touch. There's a great range of sweets, the little ones are only $1.50 each. You can buy most of these sweets at Thai supermarkets around the corner but here you can buy them in any quantity you want. And it's a bit of fun. Our sweety stash, $9 worth. Thanon Khao San Menu - click to enlarge. Thanon Khao San is at 413 Pitt Street, Haymarket, ph 92111194. Open 7 days for lunch (11am to 4pm) and dinner (5pm - 3am). It's been a while since we've been excited about Thai food, it's great to be back. We look forward to trying 3 Mamas Chefs across the road which has some great looking noodle soups, and House when we are feeling flush. Mmmmmmm......sounds good. This is another place I walk by daily but never gone in to try...this place and 3 mama. Shall check if they do takeaway. The pork sounds so yummy. So does the spicy soup...it's been a while I found something spicy enough! Being perankan means I need my chilli! Thanks for yet another appetizing recommendation. The Kanom-Jean-Namya-Pa was plenty spicy! Tried it today! The kanom Jean namya pa has a decent kick and spiciness but not enough heat still.....but it did get my sinus track working. Not bad! I should check if I could ask them to kick it up another notch or 2 for me. That would be perfect. the menu's now different - and i think better? unsure because this was my first time there but it seemed quite a bit more extensive than the ones in the pics above. ANYWAY i had the larb neua which is a northern thai (not isaan) pork intestine larb. i've never seen it before in sydney! its not sour like the larb you're used to, instead its full of dried spices. recommended!